I had read about this movie breaking so many records commercially and surely wanted to see what the fuzz was all about. But it did not play in Indonesian cinemas when it premiered last year. Few days ago I saw that one of the cable TV that I subscribed was going to play this movie during the Chinese New Year holidays and I already marked my calendar to remind me not to miss this one out on its premiere date. So last night at 9 PM, after we came back from our weekend staycation, I got myself ready to watch it on my TV (but not before I saw the original movie first). Let us get on with the movie now, shall we? 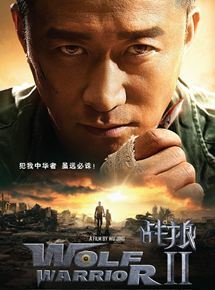 The movie started with Leng Heng (Wu Jing - SPL: Sha Po Lang, Invisible Target etc) the former soldier of special ops forces called Wolf Warrior, fighting off some pirates in African sea. It would be revealed later the reason why he was wandering around Africa and no longer working with the Chinese military. He befriended with a young African boy who referred to him as his god-father. When a military coup against the existing government happened, all the Chinese people working or doing business there had to seek refuge in the Chinese embassy, including Leng Heng and his god-son. However, there were still some Chinese people including a very important doctor who were not able to go to the embassy. Leng Heng who found out about this and also had his own personal agenda, volunteered himself to save them. That was when he met with Dr. Rachel (Celina Jade - Shado in Arrow TV series) and an African girl named Pasha who Leng Heng had to rescue from the clutches of a mercenaries group led by Big Daddy (Frank Grillo - Beyond Skyline, Captain America: The Winter Soldier etc). So could Leng Heng save all the people including some Chinese & African factory workers from the attack of Big Daddy and his gang? Find them all in this heavy action packed movie. Is there such thing as too much action in a movie? I think this was the first time I experienced it. The movie actually started brightly with some wild under water fight sequence that at first I thought was computerized, but then I realized it was not (so it was pretty awesome). Then during the military coup, the fight scenes were also done brilliantly where Wu Jing illustrated his amazing martial arts capability. After that there were scenes after scenes of short hand combat, gun shooting, explosions and so on until the climax where tanks were involved. I am a fan of great action sequence as much as the next guy, but somehow in this movie, I got a bit exhausted during the final scene. It felt a little bit too much and energy absorbing (however, I still loved the ultimate fight between Wu Jing and Frank Grillo). Though to be fair, it might also because those climax scene was showing at almost 11PM when I was already a bit tired earlier (the movie had a little over 2 hours duration). Who knows what could happen had I seen this movie in the cinema last year? I might be feeling totally pumped watching the climax. Now this movie was truly as advertised. It was full of action and a whole lot of patriotic stuff. The movie felt a bit like promotion/advertisement of how good the Chinese military were and how they would do anything to save every single Chinese people everywhere. There was a brief message in the end that mentioned this. During the mid end credit scene there was a scene that hinted the possibility of another sequel (which I guessed would be a default with such awesome commercial success). There were also some bloopers a la Jackie Chan's movie here for us to enjoy. Apart from the action sequences plus those patriotic scenes, the movie was having a little bit of funny moments with the appearance of Celina Jade who was a more fun character as opposed to Lieutenant Long Xiaoyun (Yu Nan - The Expendables 2, The Taking of Tiger Mountain etc) who felt very serious in the first movie. She did have a brief appearance as well in this movie. Another character who gave a little bit more color was the factory owner Zhuo Yifan (Hans Zhang - Hearty Paws 2, The Four TV series etc). Wu Jing really gave his all in the fighting scenes here. He happened to be the director of this movie and its predecessor as well. Being a real martial artist, it was no surprise that he was able to show lots of crazy action stunts in the movie. As an action movie, this one did not disappoint. If you are a fan of full action movie and not be bothered too much with the plot, then this one should be a treat for you. I myself did not have the best of time in the end due to reasons mentioned above. But overall I still felt it was a wonderful action movie. If you are a movie audience who rely solely on the good writing or wonderful acting, then this might not be your cup of tea. This movie would be playing in the next few weeks in Celestial movies channel. So if you want to catch this and you happen to subscribe to the channel, you certainly can give this one a try. Oh btw, it would probably be better to see the first movie before you see this one to understand a bit better on the earlier part and some background story.